Temperature : Max. 46° C and Min. 21° C in summer. Max. 22° C and Min. 06° C in summer. The centre city is a visual and aesthetic feast, for the builders of Gwalior were great architects. Take a walk through the streets of the city and you will discover old havelis with exquisitely carved doorways and windows; at almost every street crossing you will find statues of the Scindia family. Museums and art galleries are treasure houses and beautifully maintained palaces give the city its inimitable regal flavour. 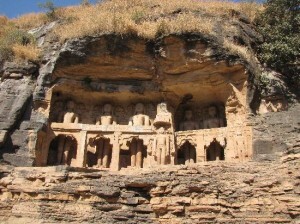 Sightseeing in Gwalior is a magical trip into the centuries gone by. Air: Gwalior is connected to Bhopal, Delhi, Indore, and Mumbai by Indian Airlines. Rail: Gwalior is directly connected by rail to all the major cities of India. 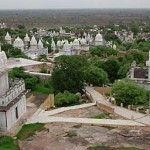 Road: Gwalior is situated on NH 3 and is well connected by good roads with Agra 118 km, Bhopal 490 km, Shivapuri 112 km, Indore 486 km and Ujjain 489 km. Sound and light Show: Madhya Pradesh Tourism Development Corporation runs Sound and Light show near Man Mandir in Hindi and in English every evening.Amitabh Bachchan, the Indian super star, narrates the story of Gwalior in his mesmerizing voice. 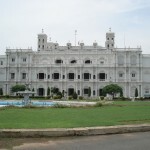 Gujral Mahal: Within the fort are some marvels of medieval architecture. 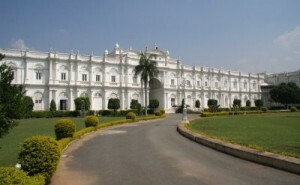 The outer structure of the Gujari Mahal has survived in an almost total state of preservation; the interior has been converted into an Archaeological Museum. Open everyday from 10 to 5 pm. Except Mondays and Gazatted holidays. 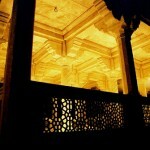 Man Mandir Palace: Built by Raja Mansingh between 1486 and 1517. The tiles that once adorned its exterior have not survived, but at the entrance, traces of these still remain. There is a charming frieze here of ducks paddling in turquoise waters. Vast chambers with fine stone screens were once the music halls, and behind these screens, the royal ladies would learn music from the great masters of the day. The Emperor Aurangzeb had his brother, Murad, imprisoned, and later executed, here. Close by is Jauhar Pond, where in the Rajput tradition, the ‘rains’ committed mass ‘sati’ after their consorts had been defeated in battle. Suraj Kund: Though the major portions of the fort were built in the 15th century, references to this gigantic complex can be traced back to 425 AD. 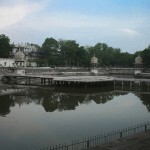 Older than the city is the Suraj Kund within the Fort walls, the original pond where the Saint Gwalipa as he was later known, cured Suraj Sen, or Suraj Sen, or Suraj Pal. Jai Vilas Palace: Splendour of a different kind exists in the Jai Vilas Palace, current residence of the Scindia family. Some 35 rooms have been made into the Scindia Museum, and in these rooms, so evocative of a regal lifestyle, the past comes alive. Jai Vilas is an Italianate structure which combines the Tuscan and Corinthian; architectural modes, The imposing Darbar Hall has two central chandelles, weighing a couple of tones, and hung only after ten elephants had tested the strength of the roof. Ceilings picked out in gilt, heavy draperies and tapestries, fine Persian carpets, and tapestries, fine Persian carpets, and antique furniture from France and Italy are features of these spacious rooms. Monuments: The father of Hindustani classical music, the great Tansen, one of the nine Jewels’ of Akbar’s court, lies buried in Gwalior. The memorial to this great musician has pristine simplicity about it, and is built in the early Mughal architectural style. More opulent than Tansen’s Tomb, is the sandstone mausoleum of the Afghan prince, Ghous Mohammed, also designed on early Mughal lines.Particularly, exquisite are the screens that use the pierced stone technique, as delicate as lace. The Kala Vithika: The Kala Vithika is another treasure house of the arts. It remains closed on Sunday and public holidays. The Municipal Corporation Museum: The Municipal Corporation Museum, which is open all days except; Mondays, has a very fine natural history section. This entry was posted in Gwalior, Madhya Pradesh and tagged about gwalior, Gujral Mahal, Gwalior Fort, gwalior images, gwalior photo, gwalior photos, gwalior temp, Jai Vilas Palace, Man Mandir Palace, Monuments, nine Jewels’ of Akbar’s court, Sound and light Show, Suraj Kund, Tansen's tomb, The Fort, The Kala Vithika, The Municipal Corporation Museum. Bookmark the permalink.